I mean the kind of story that has so much magic and grace in it that you find it too good to be true? You've come to the right place. Brew a cup of tea, call your favorite dog, cuddle up and read this aloud. Trust me. Your dog will like the story as much as you will. Only two weeks ago, I wrote a piece about Star Gazer that I posted here. If you haven't read that post, you might want to read it before reading this. It talks about how Gazer and I were soul mates, how he worked shamanically, what he taught me. And that he had died. But what I didn't share was the story of how he was going to come back. Huh? Come back? As in come back into a body? To, as the popular culture would phrase it, reincarnate? To be honest, I still have no idea about how it all works, how a dog decides in advance that he is coming back, and lets his beloved know in advance. And how to follow certain steps so everything will work according to plan. Because I do not believe in reincarnation (only because it seems too simple, an easy way to explain things that are unfathomable), I have to say that this story becomes even more miraculous if you take that concept out of the picture entirely. Let me begin at the beginning, which was pretty close to the end. When Star Gazer was 10, I got a call from my first shamanic mentor who lived in Idaho. She said she was coming all the way to Washington to tell me something about Gazer. She and Gazer had a very special bond. When I journeyed for the first time, Gazer was with us. Gazer knew Regan as both beloved friend and as journey partner. In my three-year apprenticeship, Gazer was always with me when I journeyed with Regan. Always. When Regan arrived from Idaho, we went out to dinner. I knew she would share when the time was right, and sure enough, after desert she said, "Gazer came to me in a vision. "He said he wasn't going to be around for many more years, and the veil was beginning to get thinner." Once the words came out of her mouth, I began to tear up. The thought of losing him was unbearable. As he got older, and I saw him change, I would try to imagine how life would be without him. I never got very far. Tears would start, and a spin downward that was pitiless. Even the thought of not having him was way too much to bear. "But there is more news," she said. "He is coming back. He says your work together is not done, and so he will come back so you can continue together." To say I was stunned doesn't cover it. He would come back? Really? I mean REALLY? A dog's loyalty is fierce, as any shamanic practitioner knows. It takes a LOT for a dog to move on after death because he will, so often, wait for his mistress or master to die before moving on. But to come back? My hand shook so hard I had to put the coffee cup down. My brain couldn't understand. I physically froze. "How?" was the only word I could get out. "I have no idea," she said. Trying to understand how the spirits work is something beginners do. She knew I knew that and I really did understand it. But my brain couldn't take it all in. "Here's what you have to do. On the day of Gazer's death, tell him the name of the breeder you will call when you are ready for him to come back after his death. Then let him go, and when you are ready, call the breeder and tell her you want a puppy. He'll come back in the body of the new dog." On the day of his death, I did as I was instructed. It was much worse than I had ever anticipated because he screamed when the needle went in. I was lying on the floor, and cradled his head in my hands. I told him the name of the breeder. I told him to go, to go to Grandfather in the Lowerworld, and that I wanted him to play and explore. "You," I said, have always been the leader. Go and play, and I love you, I love, you, I love you, I love you, I love you, I love you.... And in that chorus, his eyes went hazy and then distant and then blank. My husband Don and I keened. I mean we were inconsolable. And I knew I COULD NOT SAY I wish you were back with me because dogs don't want to move on when they've died. They usually wait in the Middleworld of nonordinary reality, invisible to their live owners, until their owners pass. I wanted Gazer to joyfully move on through, to have his infinite time in the reality out of time where all is made of love and compassion. A few hours later, I was lying on the bed sobbing when all of a sudden a joy so big and so ecstatic came into me that my eyes opened and my whole body became still. Radiance poured into me. It was with me for 15 minutes, and then it was over. I spent the next three months grieving him (or at least beginning the grieving process), and built him an altar that I kept in our bedroom for one year. Clients and friends and students sent cards and remembrances. After a year, the complexity of his return began to dawn on me. By then, I was seeing him and often working with him in nonordinary reality. This, I thought, is such a gift. I think of how many people would give almost anything to have the chance to spend more time with their dog who has passed. And I got to do that. A lot. In one journey, he came to me and told me I had picked the WRONG breeder, and that he wanted to return through ANOTHER breeder. Of course, I agreed, especially since that breeder is renowned, gave us our Ariel, and knows more about Beardies than beardies - oh, and did I mention she is a sweetheart and a vet? After the journey, I was curious so I got on line to check out the breeder I thought I would be working with (Gazer's breeder), and discovered she was no longer breeding dogs. It took me more months to formally state the intention, call Debra and set everything in motion -- "Star Gazer, come back to this breeder in the next litter." Why did it take so long to ask him to come back when I wanted him back so much? Because I realized that all of this was quite complex. Yes, Gazer would be coming back, his essence, but the body would be different, and there were bound to be other differences; that there would be some similarities was a given. Both new being and old soul had to be adored as separate and as merged. I picked my way through the complexity as if I were picking out innumerable knots in a ball of yarn. I finally called the breeder, knowing it can take months to get a puppy. I knew I needed that extra time to really work through all of the dynamics, and so I was fine with the wait. But 6 months passes, then 9 and still no word. I called, but didn't get a return call. After a year, I started thinking that he wasn't going to come back through Pentangle Beardies, that I must have gotten it wrong somehow. Meanwhile, doubt began to plague me. I turned 60, and remembered how much energy it took to raise a beardie puppy. Beardies are known for their over-the-top exuberance and clownishness, which is why I love them so. But I have slowed down in the past 15 years. As Gazer hadn't come back, would he agree to change forms? Would he be OK as a smaller breed that would be easier to manage? I started reading about smaller breeds, and I researched for months. I did everything I could to fall in love with the Maltese, Havanese and Cotton de Tulear. I admired Bichon Frise, and studied the Imaal. It felt like a spiritual log jam. No matter what, I always ended up frustrated, saying, "but I love beardies." It all felt nerve-racking . Then, not so very long ago, I began to journey and before I could leave my body, Gazer launched into the room, put his face very close to mine and said, emphatically BRING ME BACK! BRING ME HOME! He wasn't kidding. There was NO ambiguity. He was ready and it was time to move. I got more and more miserable as I tried to figure out where he was going to show up, and how I was going to handle it all. Last Monday, without really thinking, I picked up the phone to call the breeder for the first time in months. I think back to that moment and I cannot remember why I called at that moment; it was more automatic than considered. She answered the phone, and she said, "Lora, I've been meaning to call you." It turns out her female went in and out of two seasons without conceiving. But now, she said, there were four-week-old puppies. Before I could say anything, she said "there was only one male. And, Lora, I had to give him to other people who have been waiting five years for a male puppy." I said I understood, which I did, but felt more confused than ever. And then she said, "One thing you should know. "One of the females has a white star in the middle of her back. I have never seen anything quite like this before." I don't know that I had ever felt deliriously happy before that moment. The term never really made sense to me until my happiness hit and I became delirious. She explained that the mark was square in the middle of the top of the back where beardies don't get white markings. I immediately said "She's mine. He's back. Oh. My. God." You'd think all of this would be enough. You'd think after doing shamanic work for 15 years, having been cured of an incurable illness, and seeing too many miracles to count, that I would find them easier to believe. But the grace, the love is so big I often sink to my knees before I can take it all in. I called two shamanic peers, and asked them to journey to confirm that this puppy really was Gazer. One of them said that in the journey a big silver dog came running up to her, put his paws on her chest and said grinning "Of course! How much more of a sign do you need?" The other practitioner concurred. So although I fretted and strived, worried and maneuvered, everything actually went perfectly without me really having to do anything more than show up and follow directions (that is how shamanic work usually goes). When I picked the wrong breeder, and Gazer knew it, he directed me to the perfect breeder. When I set the intention for him to come back in the next litter, he did. I have been saying for the past year that the best time to get him back would be the spring of 2012. 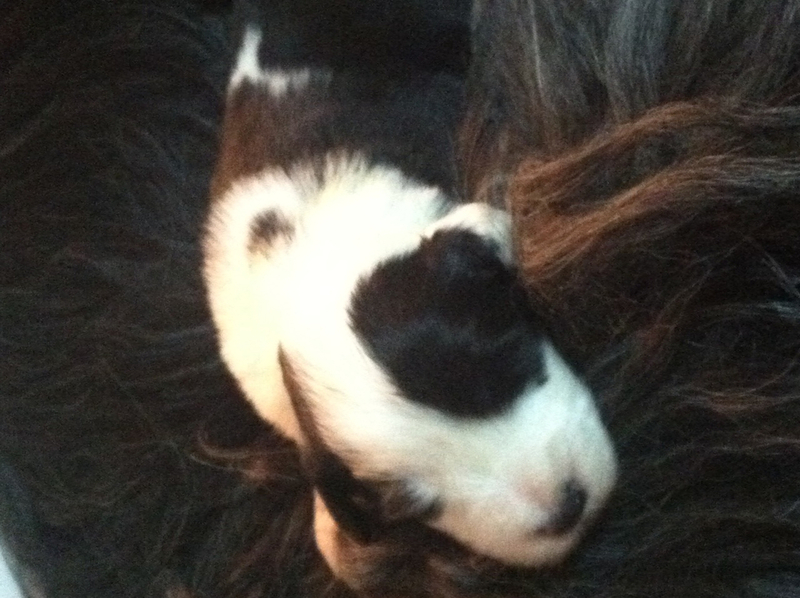 I will be bringing him home in May. I have worked at understanding this is a soul reborn, and not a form reborn, and he helps me by coming back as a female. Who gets this kind of miracle? That's what I keep thinking. I am dazed. I feel far more humility than even joy today. My body still can't quite take it all in. But tomorrow, at about this time, I will be entering the Deb's home. She'll bring us to the puppies, still so young that they will be in a room by themselves with their Mom. I'll see the star on her back before her face. She'll fit in my hands, and as I raise her to my lips to kiss her, I know her body will be warm and soft. I will feel and smell her quiet breath. And after the kiss, I will whisper "Welcome home. I love you, I love you, I love you, I love you, I love you...."